PREIT stock retreated after its recent earnings report, driving its yield up to more than 9%. Yet the stock is poised to deliver big gains for investors over the next few years. 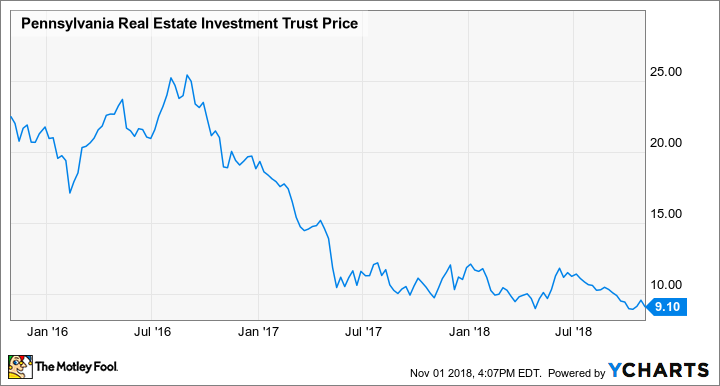 In recent years, Pennsylvania Real Estate Investment Trust (NYSE:PEI) has embarked on an aggressive strategy of selling its least desirable malls and replacing its least desirable tenants -- typically struggling department stores -- with more attractive uses. So far, investors haven't shown much appreciation for the strategy. Instead, they have zeroed in on declines in PREIT's adjusted funds from operations (FFO). Adjusted FFO per share is on pace to come in between $1.53 and $1.58 this year, down from $1.89 in 2015 and $1.96 in 2014. As a result, PREIT stock has lost about 60% of its value over the past three years. PREIT Stock Performance, data by YCharts. However, PREIT is finally close to stabilizing its adjusted FFO -- and then returning to growth. Meanwhile, it has dramatically upgraded the quality of its portfolio. And with its dividend yield having recently crossed the 9% mark, PREIT stock looks extremely appealing. In the third quarter, PREIT's adjusted FFO per share fell to $0.35 from $0.42 a year earlier. On average, analysts had expected adjusted FFO of $0.36 per share. Factors such as higher interest expense, asset sales over the past year, and a one-time tax gain in the year-ago period accounted for most of the decline. The bigger-picture issue is that PREIT's proactive campaign to reduce its exposure to Sears Holdings and other struggling department stores has been costly in the short term. In addition to the lost income from malls it has sold, PREIT has also seen rent declines in malls where anchors have closed. Aside from losing the relatively modest rent that the department stores had been paying, anchor closures can trigger additional rent declines through "co-tenancy clauses" that give smaller tenants a break on rent when an anchor space sits vacant. Once PREIT completes its redevelopment activity on currently vacant anchor spaces, its rental income will rebound. But for now, the headwind from anchor closures and co-tenancy clauses is still growing. PREIT is proactively replacing numerous anchors with smaller, more desirable tenants. Image source: PREIT. While PREIT's efforts to improve the quality of its portfolio are very promising, investors can't count on a quick recovery in adjusted FFO. Two more anchor spots became vacant last quarter, as Bon-Ton completed its liquidation. The co-tenancy impact from those vacancies will kick in later. Rising interest rates may also have a modest negative impact on adjusted FFO next year. Offsetting these headwinds, PREIT will complete all of its current anchor replacement projects by the end of 2019, replacing another six department stores with more than a dozen new tenants. Back in September, the company estimated that these anchor replacements would increase PREIT's rental income by $11.3 million by 2020, compared with 2018. However, many of the new tenants won't open their doors until late 2019, so less than half of that incremental revenue contribution comes next year. Additionally, PREIT's future flagship property -- Fashion District Philadelphia -- is now slated to open next September. The project is more than 85% leased and will provide a big income boost (and an even bigger cash flow tailwind) once it opens. But that, too, will have a bigger impact on 2020 than 2019. By 2020, Fashion District Philadelphia will be a lucrative income-producing asset. PREIT will also have replaced numerous department stores with a variety of tenants that will be paying significantly higher rent and driving dramatically more traffic to its malls. The result should be a return to growth in adjusted FFO. The one notable risk is that Sears' turnaround plan may fail, forcing the retailer to liquidate its remaining stores. That would lead to additional anchor replacement activity and another short-term hit to PREIT's rent roll. But even in that scenario, the impact would be modest and PREIT would probably be able to backfill those spaces with higher-paying tenants within a couple of years. Once PREIT gets adjusted FFO growing again, the stock could benefit from multiple expansions as investors start to give the REIT credit for improving the quality of its portfolio. This could drive substantial share price appreciation on top of PREIT's 9% dividend yield. That's why I plan to continue buying PREIT shares over the next few months.